Brooklyn Community Foundation created the Brooklyn Restorative Justice Project as a partnership with the NYC Department of Education (NYC DOE) and the Mayor’s Leadership Team on School Climate and Discipline to develop a sustainable and effective model for school discipline reform. 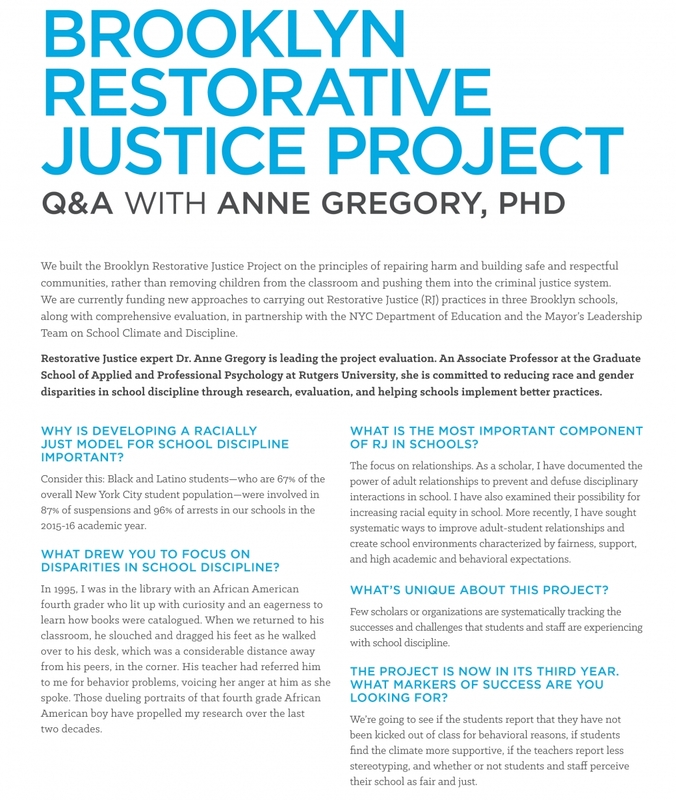 Launched with a small cohort of Brooklyn middle and high schools in SY2015-16, the 4-year, $1.8 million pilot engages nonprofit experts, principals, educators, students, and parents in implementing culturally responsive and racially just restorative justice practices as alternatives to traditional punitive discipline. What is Restorative Justice? We define Restorative Justice as a philosophy and practice that empowers all those affected by a harmful incident to decide collectively how to repair the harm, restore trust, and build a sense of community. Restorative Justice focuses on building respectful relationships that recognize the dignity and humanity of everyone involved. This effort will work to reduce the need for suspension, and will build caring communities in schools while ending disproportionately punitive discipline for students of color, students with disabilities, and LGBTQ students. In New York City schools, black and Latino youth account for 70% of students, yet represent over 90% of all suspensions. Students with special needs make up 12% of the student population, yet receive a third of all suspensions—in some Brooklyn schools, they account for upwards of 90% of suspensions. The creation of a model for progressive school-based disciplinary reform that can be scaled across the New York City school system (and beyond). In school districts in Oakland, Denver, and West Philadelphia, restorative justice programs have demonstrated success in reducing suspensions, arrests, and overall incidents of violence, as well as improving student attendance and graduation rates. The Brooklyn Restorative Justice Project will also focus on addressing disciplinary disparities affecting students of color and students with special needs, who represent the majority of in-school suspensions and arrests. In 2015, the Foundation selected a small cohort of community-based nonprofit organizations through a competitive RFP process. Nonprofits were then matched with schools previously identified by the NYC DOE. Each program receives $100,000 per school year in funding from Brooklyn Community Foundation. New York Peace Institute and the Rachel Carson High School for Coastal Studies in Coney Island. New York Peace Institute is one of the nation’s largest community mediation services, with expertise in special education mediation. They have previously partnered with the Department of Probation, the New York City Department of Education, NYPD and the Brooklyn District Attorney’s offices. Partnership with Children and Ebbets Field Middle School in Crown Heights. Partnership with Children provides critical social and emotional support for the hardest-to-reach students and engages families in the school community so they can succeed in school, society and life. They have social workers in 32 public schools in all five boroughs and manage all community resources and support services in 12 community schools. Sweet River Consulting and Science Skills Center High School in Downtown Brooklyn. The founders of Sweet River Consulting have over 10 years’ experience implementing school-wide restorative justice policies and programs, and providing youth programming and leadership development. Sweet River Consulting is supported by the Center for Nu Leadership, a criminal justice advocacy organization in Central Brooklyn. Nonprofits support full-time Restorative Justice Coordinators in each school, who have developed strategic plans in collaboration with school leadership. Coordinators oversee all program components, including community-building restorative circles, conflict response, student reentry, positive school climate, and school-wide learning groups on restorative practices. All organizations work to ensure a racially just and culturally responsive lens to support students disproportionately impacted by punitive policies as well as address rights and responsibilities of special needs students. 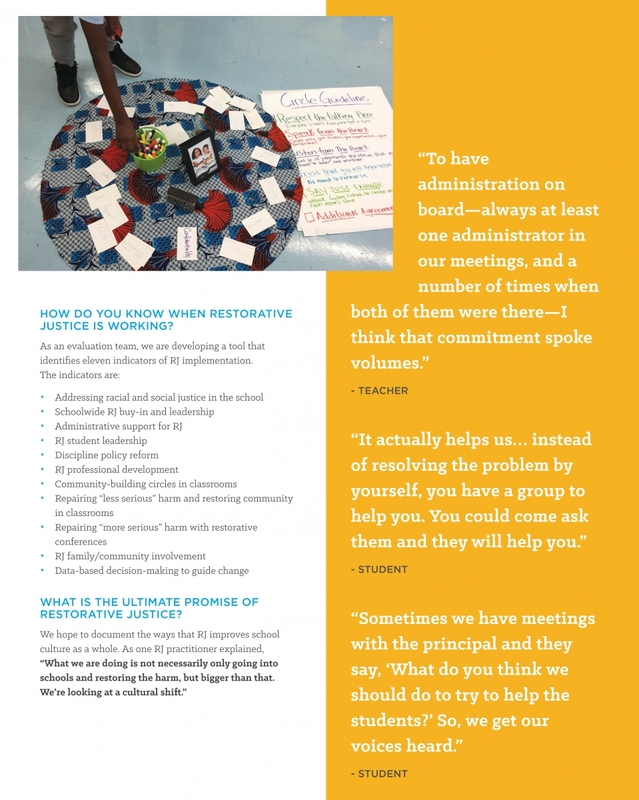 Recognizing the importance of student leadership in school culture, Coordinators also create opportunities for students to lead restorative justice programming. Schools and partner organizations are evaluated based on improvements in school culture and student self-esteem, and a reduction in conflict, violent infractions, suspensions and arrests. All participating schools and organizations collaborate to share lessons learned and best practices, as well as develop benchmarks and evaluation tools. Learn more about the grantee selection here. 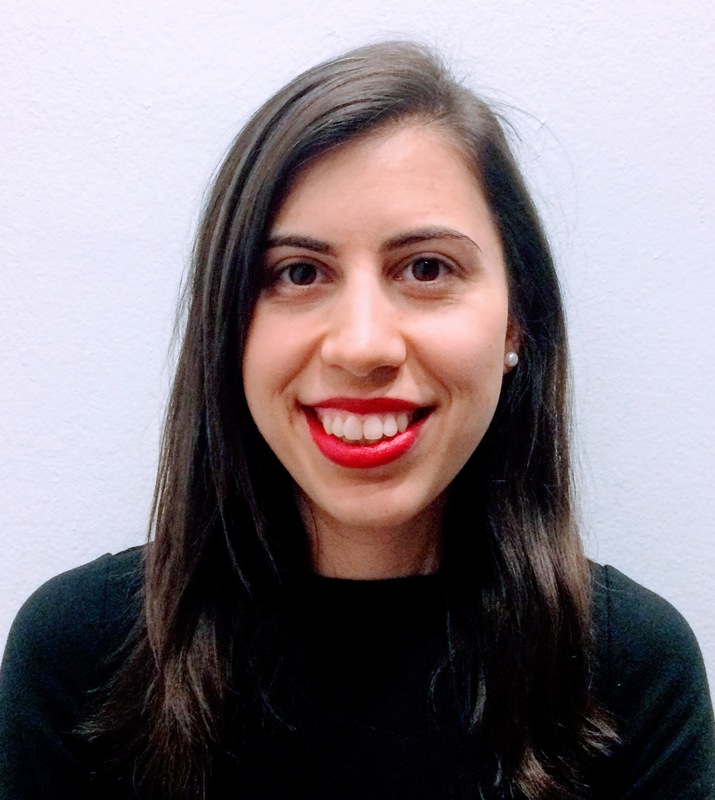 In 2016, Dr. Anne Gregory, Associate Professor at Rutgers University’s Graduate School of Applied and Professional Psychology, joined the project as our evaluator, working with the Foundation over four years to establish benchmarks, monitor outcomes, and measure success. Anne has a deep experience working with schools to improve restorative justice implementation and her commitment to high quality restorative justice in schools is driven by the need to reduce race and gender disparities.